Juventas New Music is unique in its focus: nurturing and showcasing the music-making of today’s most brilliant emerging composers. Emerging composers cannot build their craft and gain recognition without opportunity. ​Boston-based Juventas New Music works on a national and international scale, serving as an incubator for promising musical pioneers by giving them an opportunity to develop, present, and promote their work. The ensemble’s core musicians and numerous guests are versatile artists with backgrounds not only as world-class performers but also as composers, conductors, educators, and community leaders, who can lend their breadth of experience to emerging creators. -- Performer Magazine, March 2012. Juventas New Music Ensemble voices concert music of the present and future, nurturing and showcasing today’s most brilliant emerging composers. ​Juventas’ collaborative productions cross disciplinary boundaries, creating an unparalleled artistic experience for audience members. The ensemble has partnered with dancers, painters, scientists, poets, visual artists, puppeteers, and robotics engineers. 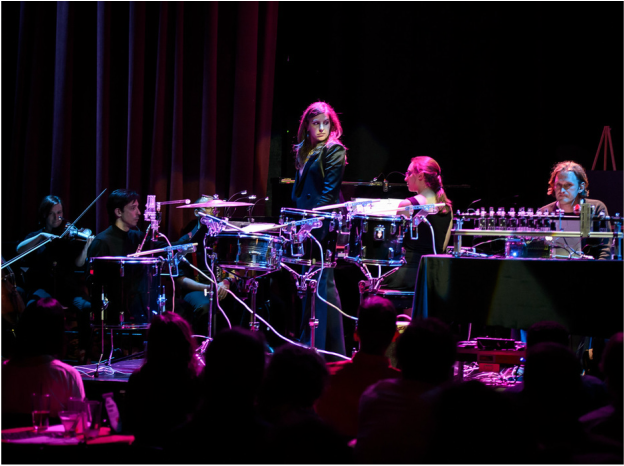 A leader in the field, Juventas hosts the Boston New Music Festival, a weeklong showcase of Boston’s contemporary music scene, with concerts, master classes and symposia. Juventas’ annual Opera Project has received recognition from The American Prize, National Opera Association, and New York City Fringe Festival. The ensemble has held residencies at Boston Conservatory, Harvard University, Longy School of Music, Middlebury College and Worcester Polytechnic Institute. Juventas has also performed on recordings with Innova Recordings, Parma Records, and New Dynamic Records. ﻿Join us for music that ​celebrates today- and Tomorrow. Juventas has been featured repeatedly as the “Classical Music Pick” by The Boston Globe and has received awards from the National Council for the Arts, Cambridge Arts Council, Harvard Musical Association and Free for all Concert Fund, and has performed at the NYC International Fringe Festival. We hope you will attend one of our performances, check out our resources for composers, and support our work!